Water, plastic waste and climate action are the emerging hot topics to come out of the latest Better Futures report, released by Colmar Brunton this week. The Colmar Brunton Better Futures 2017 research surveyed New Zealanders on environmental and social issues, including the United Nations Sustainable Development Goals (UN SDGs). The company’s analysts say that despite social issues topping the list of Kiwis’ biggest concerns and most important Sustainable Development Goals, environmental issues – particularly water, plastic waste and climate action – are emerging as hot topics. Colmar Brunton’s Chief Client Officer Sarah Bolger says this comes as no surprise, with New Zealand’s ‘clean green’ identity heavily reliant on all three of these issues. “Eight out of ten New Zealanders said that clean water and sanitation is an important issue, furthermore, 91% of those surveyed think that all Kiwis are responsible for improving the quality of our waterways,” she says. “Build-up of plastic in the environment is a significant concern for Kiwis and 2017 is the first time this issue has made the top 10 concerns for New Zealanders,” she says. “It comes in at fifth after hefty social and economic issues including: violence in society; protection of children; the increasing cost of living; and suicide rates. When it comes to Kiwis’ views on the UN SDGs, social issues, such as: no poverty; good health and well-being; and zero hunger, feature prominently in the top 10 but climate action is among the fastest rising issues coming in at number four. In fact, two thirds of New Zealanders agree that climate change is the biggest problem the world is facing today. 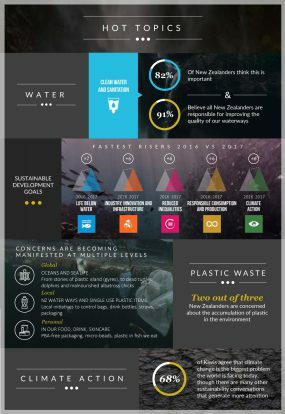 The Sustainable Business Council says this year’s research should be a wake-up call to New Zealand businesses that the accumulation of plastic is now a concern for two out of three Kiwis. Public Relations and Corporate Social Responsibility expert Nikki Wright of Wright Communications says consumers will support businesses and brands that share their concerns and are taking action to address them. Wright warns that businesses failing to respond to consumer issues by developing credible and clear sustainability plans, risk not only losing customers but also being unprepared for the inevitable future government regulation in this area.